Is your favorite classic anime on the list? Last month, we listed down our Top 10 Best Anime Openings of the Modern Era. The whole process of narrowing down all the great openings was difficult, so naturally we just had to do it again (because we all love anime and hate ourselves). This time though, we picked the best classic anime openings, meaning anime series that first aired in the 90s or older. If you we had a tough time with modern anime, picking between classic animes was even more difficult! Especially as we tried to be objective and not just list anime that we have a personal connection to. Before your Kuroko no Basukes and your Haikyus, there was Slam Dunk, the daddy of all sports animes. Not only did it popularize the ‘sports anime’ genre all over the world, it was also a great anime in its own right, complete with a retro and catchy opening theme in Kimi ga Suki da to Sakebitai. The opening showcases the show’s cast of characters doing awesome dunks, complemented by a memorable song that’s reminiscent of retro tracks such as Van Halen’s Jump. It’s not wonder the anime became a big hit, especially in the Philippines (we’re a basketball country after all). I’m sure most, if not all of us have fond memories watching Rurouni Kenshin aka Samurai X on TV in the late 90s and early 2000s. The adventures of Himura Kenshin/Battousai is so memorable that it’s even referenced up to the present day, thanks in part to its awesome opening. Sobakasu, Rurouni Kenshin’s first opening song, has a lighthearted feel to it that’s in contrast to the show’s more serious subject matter. The contrast works well, plus the animation has aged gracefully, making it deserving of its spot in our list. If you ask Gundam fans what their favorite series is, you likely won’t get a definitive answer. But there is no doubt that Gundam Wing is the series that propelled the franchises’ popularity internationally (much like what Final Fantasy VII did to the FF series). The series gained tons of fans for its great storyline and exciting mech battles, plus it has one hell of an opening song. From just watching the opening, viewers are treated to awesome Gundam battles accompanied by a catchy song in Just Communication. The opening isn’t all fighting though, as it’s balanced by beautiful landscapes and a showcase of the series’ characters. While some mecha anime openings are more distinct (like Macross or Voltes V), only a few openings are as well-rounded as Gundam Wing’s. A good classic anime opening needs to have a distinct visual style and sound to make it stand out and be memorable. One anime that perfectly embodies this is Lupin III; sure it may be an old anime, but its opening is still a blast to watch! The opening song “Theme from Lupin III” is a jazzy track that hasn’t aged a day, and its visuals are stylish enough to not look badly dated. Lupin III’s opening is also a great character showcase, as it highlights the main traits of its cast clearly. The video above contains only the song, but this link contains the actual opening, but with a Persona 5 opening playing side-by-side. Sailor Moon is one of the most popular Magical Girl animes ever, and for good reason. The show revitalized interest in the magical girl genre, and it has one of the best female superheroes in Usagi Tsukino/Sailor Moon. And of course, the show has a great opening. The first opening for Sailor Moon — Moonlight Densetsu is sixth on our list as not only is the song great, the colorful sequences are just lovely. It has also become a template to future magical girl anime openings, with animes such as Madoka Magica having an opening that’s reminiscent of Sailor Moon’s. Not all good anime openings have to be technical masterpieces, just watch Ranma 1/2‘s opening. Sure, it mostly consists of the cast running around, but it just works. From the song to the art style, the whole opening is way too cute! While some of the entries here in the list have subversive openings (i.e. a direct contrast to the series’ tone), Ranma 1/2 is anything but. The opening’s cutesy style is very much in the spirit of the anime’s lighthearted comedy/action tone. You can’t get any more awesomely retro than the first Dragon Ball Z opening. Are the song and animation style dated? Of course they are, but in the best way possible! Cha-La-Head-Cha-La stands as one of the best, if not the best representation of the 80s anime style. Its fourth spot on our list is not just because of nostalgia and its “80s-ness”, it’s also due to it being an objectively great opening. 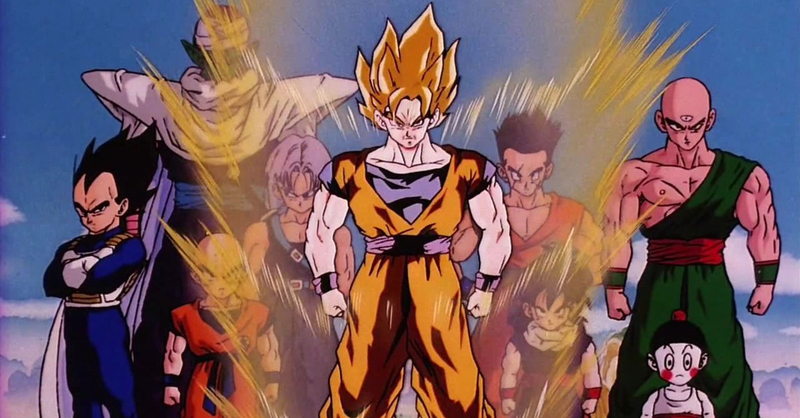 It showcases the abilities of the cast, and gives viewers a glimpse of Goku and Vegeta’s Super Saiyan modes. Not to mention that Shenron’s appearance is still well-executed, as viewers were made to see his absolutely massive size in comparison to the cute little Gohan. Whether or not you actually understood what happened in Neon Genesis Evangelion (I sure didn’t), one thing’s for sure, the series has one of the best openings ever! Up to this day, A Cruel Angel’s Thesis is still one of the most popular songs of any anime, thanks to how much of an earworm it is. Aside from being catchy, the intro is a near-180 in tone from the Evangelion series. While it’s quite the upbeat opening, the series is anything but. The opening sets viewers up for an easy watch, which makes NGE’s dark and thematically heavy story be all the more impactful. 1. Cowboy Bebop – Tank! Out of every classic anime opening that we’ve watched and re-watched, nothing still beats Cowboy Bebop. Composed by the musical genius that is Yoko Kanno, the opening’s big band jazz track Tank! has not aged a day, and is one of the best songs ever used in an anime (or even in any medium if you ask me). While I could wax poetic about Tank! all day long, the opening itself is equally stylish as well. The disticnt noir-ish style of the opening fits perfectly with the song’s energy, all while setting the series’ mood for viewers. Not only that, there are also some scenes that have relevance to the story of Cowboy Bebop. An anime opening doesn’t get any better than this! Do you agree with our list? Or did you think we missed some of your favorite classic anime opening? Sound of in the comments below! And in case you missed it, here’s our Top 10 Best Anime Openings of the Modern Era. Next articleSleek, Brilliant, Beautiful. The OPPO F9 officially unveiled in the Philippines!